COLOSSIANS 3:1 KJV "If yee then bee risen with Christ, seeke those things which are aboue, where Christ..."
1If yee then bee risen with Christ, seeke those things which are aboue, where Christ sitteth on the right hand of God: 2Set your affection on things aboue, not on things on the earth. 3For yee are dead, and your life is hid with Christ in God. 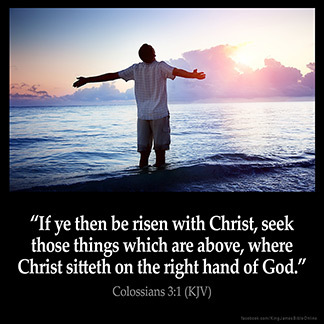 If ye then be raised with Christ, seek those things which are above, where Christ sitteth on the right hand of God. If however you have risen with Christ, seek the things that are above, where Christ is, enthroned at God's right hand. Therfor if ye han risun togidere with Crist, seke ye tho thingis that ben aboue, where Crist is sittynge in the riythalf of God. 3:1 If ye are risen, seek the things above - As Christ being risen, immediately went to heaven. Col 3:1 The New Life in Christ SUMMARY OF COLOSSIANS 3: Fellowship with the Risen Christ. Our Lives with Him. Hence, All the Evil Deeds of the Old Life Must Be Put Away. All Distinctions Done Away in Christ. Hence, Brotherly Love Must Be Cherished. The Indwelling of Christ's Word. Concerning Songs. Various Duties. If ye then be risen with Christ. The Revised Version is correct: "If then ye were raised together with Christ". A definite act, not a state, is referred to. The definite act is named in Col 2:12. When they were "buried with him in baptism", they were also raised from this burial with him through faith, quickened. Hence here he says, "If then ye were raised with him", if your obedience was from the heart and in faith, if you rose therefore "with him" (these are the emphatic words), then seek those things which are above. The risen Christ ascended; let your aspirations ascend also. Where Christ sitteth on the right hand of God. See PNT "Eph 1:20".